With the ProfileSelect system, stampers input press speed (strokes/min. ), feed-angle window and feed length. 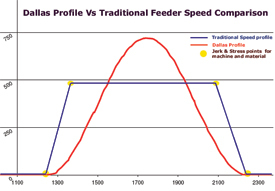 ProfileSelect then utilizes the full feed window of the press to automatically generate a smooth feed-motion profile to complete the length requirement in the allotted feed window. Previous feed controls use a trapezoidal motion profile, which can create quick, sudden motions that increase the chance of slipping, strain the die and material and damaging the part surface. The ProfileSelect’s sinusoidal profile provides a smooth motion and material feed while utilizing 100 percent of the press-feed window. The system is available on the company’s new units, as well as a retrofit package for Dallas controls produced since 2005; add a control update package to retrofit it to older Dallas controls.